Hello Radiant readers, friends, and fans! I (Kelley) have some new wonderful people that I’d like to introduce you to. They’re pretty sweet together aren’t they? Let me tell you, their sweetness factor only increases when you see them in person! Even with two giant cameras in their faces, on the day of their engagement shoot they were full of laughter, hugs, kisses, and kind words for each other. I also have to point out the fact that these two are absolute troopers! If you’re in the Phoenix area, you know that we’ve recently been having a “cold snap”, which is completely out if the ordinary for us desert dwellers. Add in the fact that Michael was in shorts (a true Phoenician man, Michael only owns one pair of full length pants!) and Katie was donning a (completely beautiful) dress, and you’d think they would have been all shivers and goosebumps. But no, these two didn’t seem to notice the cold at all. They were just happy to be together. Katie and Michael, thank you so much for toughing out the cold and giving us the honor of recording this special time in your lives! We can’t wait until your Sedona wedding this June! I promise that it will be much warmer. 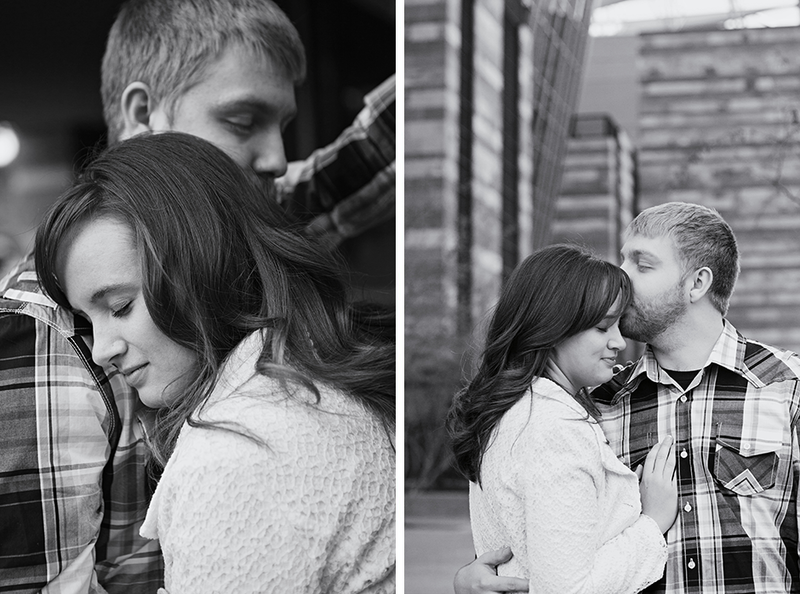 Click to see the rest of the photos from Katie and Michael’s Chilly Engagement Session. This is a newborn session that’s extremely close to my (Kelley’s) heart. Want to know why? See that cute baby girl? I’ve known her from the very first second she was born. She’s my sweet little niece, Audrey. Yup, that’s right, I get to hold and cuddle this little one as much as I want. Try not to be too jealous. In addition to getting lots of cuddles, I think it’s also safe to say that she’s going to be photographed A LOT! I mean how could I possibly help myself? She’s pretty much the most adorable model ever! When my mom came into town to meet and visit with Audrey, I decided it would be the perfect time for her very first photoshoot: a newborn session. I shared my idea with my sister, and she was camera ready and on the scene in just a couple of hours. Technically, little Audrey is already a month old (a little older than some of the newborns we photograph). You see, she was born right around Christmas time, and had some jaundice issues for a while. After she started feeling better, Phoenix started enjoying some rainy weather. Then, when my mom came in to town, we finally had a perfect day to shoot. And we made sure to snap a few grandma snuggle shots as well. It was so awesome to be able to take photos of my sister with her very first newborn baby, and know that these will be photos that our family will cherish for years to come. It’s not very often that I get to be on the receiving side AND the photographer side of important family photos. For me, the experience really helped to reinforce the importance of the work that photographers do. I’m so happy you came to join our family little miss Audrey. And I can’t wait to share these pictures with you again when you’re a little less small. Jackie and Charlie met in Sunday school as youngsters. Now they’re all grown up and excited to be planning their wedding, which will be taking place in the same church in which they met. Jackie and Charlie are a pretty popular couple, so it’s likely that quite a few of you readers are seeing these photos and shouting, “I KNOW them!” at your computer screen. For those of you that may not be quite as familiar with these two, let me tell you a little bit about them. This illustration may work best if I (Kelley) give you a mental image to work with… Picture Superman and Wonder Woman getting married… Yes, I think that pretty much sums up the amazingness of Jackie and Charlie. For real, not only are they awesome to be around, but I’m pretty sure they both have super powers of some kind. Wait WHAT?! I’m pretty sure that’s the speed at which Superman flew around the globe! And over 20 miles of running? I think it’s safe to say I would keel over after about five miles. Jackie made me and Josh feel a bit better by admitting that she finds it difficult to finish a one mile run. However, later on when I was “hinting” at Josh that he was a little too close to the water for me to feel comfortable, Jackie revealed her super power. “Don’t worry, if he falls in, I can save him.” Turns out Jackie is on the swim team at Grand Canyon University. So while Charlie has been running around, Jackie has been jumping into OUTDOOR pools in the middle of the WINTER and swimming like a fish! I think those examples are proof enough of the amount of determination and hard work that these two are going to be putting in when it comes to wedding planning. Congratulations on your engagement Jackie and Charlie! I have to say, Josh and I are both looking forward to your wedding, and we’re sure that it’s going to be a “Super”, “Wonderful” day! 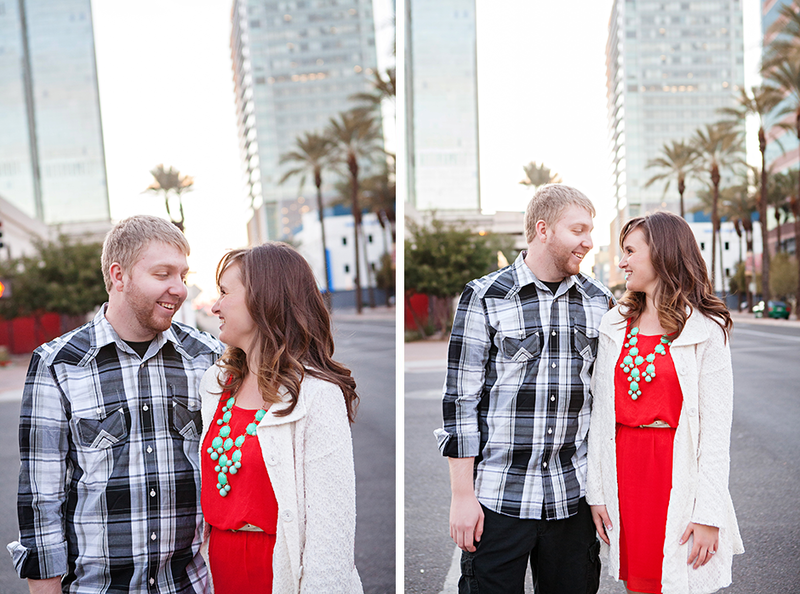 Click to see the rest of the photos from Charlie and Jackie’s Super Wonderful Engagement Session. Raise your hand if you’re still exhausted from the busy holiday season! OK I know that most of your hands SHOULD be up but you’re actually still too exhausted to physically hold them in the air! Sure we’re all worn out, but I really think that Vicki and Franz beat us all! They had all the holiday fun to participate in, plus they bought a house, AND had a baby! Now that is a whirlwind of major events. They not only survived the chaos that major events inevitably bring, but they enjoyed every second of it! So when it came to picture time for their new little baby, what better place to do it than at their new house with all the things they love surrounding them!? As you can see, their 2 dogs are definitely a part of the family, and once you meet them it’s easy to understand why! They were some awesome little pups who NEVER got in the way during the photo session… well, OK, maybe just a couple times, but they were just making sure we got some great shots of them too! And what would a newborn photo session be without a ride in a car? Wait…what? At least that’s the case when your parents met while designing cars together! So of course we had to get one or two in there with cars involved! Overall, it was a beautiful session, on a beautiful day, with a beautiful family, in their beautiful new home. Thanks to the 3 of you (well the 5 of you, counting the dogs), for helping us have a great session together. I hope the rest of this new year, full of new things, goes as well as your photo session to commemorate them all went! Click to see the rest of the photos from Vicki and Franz’s new baby photo session. It started out as a first date at In and Out Burger, and led to a beautiful wedding on a late December evening. Now, these two crazy kids are looking forward to spending the rest of their lives together, and enjoying every adventure along the way. It may sound like the plot to a gooey romantic movie, but for Hallie and Jonathan, it’s real life. Yup, it’s their very own real life love story. Hallie and Jonathan are definitely a couple to be envied. Why you ask? Well, for starters, just look at them. These two are head over heels in love with each other, and who doesn’t want that kind of awesomeness in their life? They share a kind of love that allows them to really be themselves when their with each other… Their very own silly and spontaneous selves. During the whole wedding day, Hallie and Jonathan both kept insisting that we take more “silly” pictures, because those are the ones that let their real personalities shine. They’re obviously big ol’ goofballs at heart. On top of all of this head over heels in love/silly goodness, there’s one other area of Hallie and Jonathan’s life that some may find covetable. Just days after their gorgeous wedding ceremony, Hallie and Jonathan packed up their belongings and got ready to start a new adventure together. Yes, I know lots of couples do this after their wedding day… But Hallie and Jonathan’s next adventure is taking them to a new life in Hawaii! Yes, I said Hawaii! While many of us dream about just visiting the aloha state, Hallie and Jonathan can now call this magical place “home”. What an awesome way to start their new life together! Hallie and Jonathan, Josh and I are so happy that we had the chance to get to know the two of you before you headed off to Hawaii! Congratulations on your marriage and your next big adventure together! Click to see the rest of the photos from Hallie and Jonathan’s Late December Wedding.